My name is Josh, and I’m excited for Justice League. I know it’s cool to dog the DCEU, and hey, for the most part they deserve it! But Wonder Woman was amazing, and it’s so good that it almost absolves the powers that be of the calamities of the previous entries in the universe. Not completely, but almost! 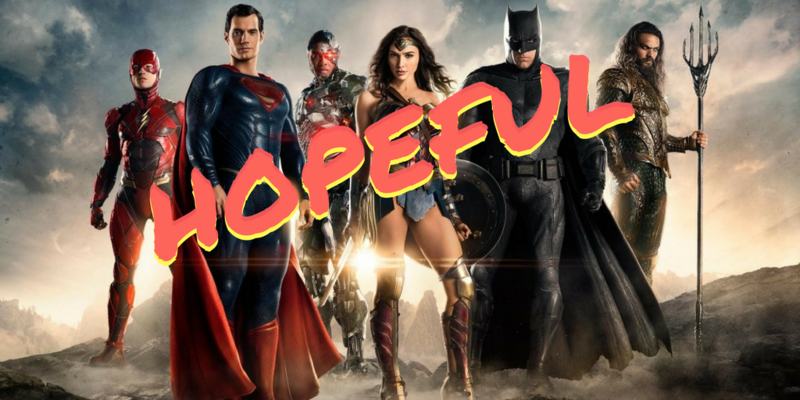 So, with the release of the next chapter in the world of DC, let me give you five reasons why I’m pumped to see Justice League. This one’s easy, and I already mentioned it above: Wonder Woman was amazing; it’s one of my favorite films of the year. It’s about as good of a superhero movie that has ever been made, and I left the film wanting to see more. So, that’s what we get in Justice League: more Wonder Woman! All due respect to the Dark Knight, but this is Princess Diana’s world, and everyone else is just living in it. My hope is that she has a major role in this film; Gal Gadot deserves it for pulling DC out of the ashes. The fact that we get to see Wonder Woman in two movies in one calendar year is reason enough to be hopeful. Perhaps it’s just wishful thinking on my part, but I have to believe that Zach Snyder and company have learned from their past mistakes and have went to great lengths to make sure that Justice League is done right. Because, why else do it? I can’t imagine that they didn’t take the criticisms of the past to heart and work to try to improve on the product. Nobody working on a film wants that film to be received poorly. And the past films, other than Wonder Woman, have been received very poorly. So, the hopeful movie lover in me wants to believe that they wanted to reverse that trend in a major way with Justice League. We can’t forget that these characters have been around a long time. Over 50 years! With that comes the obvious: a huge opportunity to put out quality characters and good stories. Because the material is right there for the taking! The lore, the history, it’s already in place; it’s just a matter of putting it on the big screen. We already had one to begin the month in Thor: Ragnarok, but this one feels different because of the obvious reason that the MCU has been around a long time and the DCEU is still just starting to plant its feet; with the MCU, there’s not much of an unknown at this point. With DCEU, there’s still a shred of uncertainty; namely, how will the actors mesh, and how will their storyline in this film shape the future. Either way, Justice League is a blockbuster movie. I don’t know about you, but I’m getting the same feeling I get the days leading up to the first weekend of May, and that’s a great feeling to have in November. 5 – It’s happening, so might as well go in hopeful. Look, this movie is happening. It’s here. So I’ve just decided to go in with a hopeful attitude. I don’t know, maybe I’m crazy. Maybe it’s the holiday season, or maybe it’s because the days are shorter, but I feel compelled to offer up some seasonal forgiveness. The past is in the past; let bygones be bygones. This is a fresh opportunity for the DCEU, and it’s a great chance to win over the skeptics out there. I’m hopeful that they’ve done right by the fans and that we’ll leave the theater this weekend happy with the film that we’ve just seen. And if we don’t, well, there’s always Wonder Woman.